Last week, BlackBerry, the new corporate name for the Canadian company formerly known as Research In Motion, unveiled their new name, their new BlackBerry 10 mobile operating system, and a pair of new BlackBerry smartphones; the BlackBerry Z10 and the BlackBerry Q10. Waterloo, ON – BlackBerry® (NASDAQ: RIMM; TSX: RIM) [on January 30, 2013] launched BlackBerry® 10, the re-designed, re-engineered, and re-invented BlackBerry platform that creates a new and unique mobile computing experience. Available on two new LTE-enabled smartphones, the BlackBerry® Z10 (all-touch) and BlackBerry® Q10 (touch with physical keyboard) smartphones powered by BlackBerry 10 offer you a faster, smarter and smoother experience than any other BlackBerry you have used before. 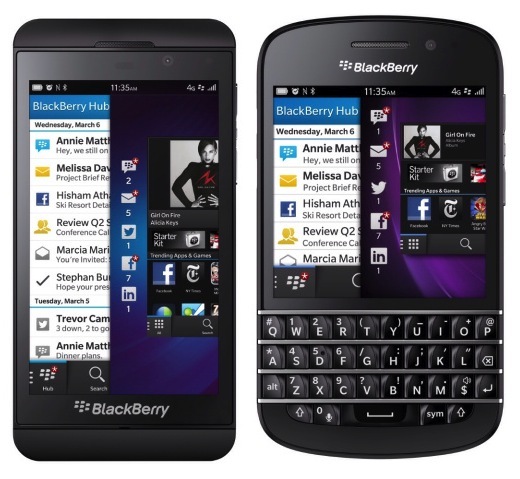 The new BlackBerry 10 smartphones are elegant and distinctive, and the fastest, most advanced BlackBerry smartphones yet. They feature 1.5 Ghz dual core processors with 2GB of RAM, 16GB of internal storage, and an expandable memory card slot. They include the latest enhancements in high density pixel and screen technology to display clear, sharp, and incredibly vivid images. Both feature a micro HDMI out port for presentations, and advanced sensors such NFC (near field communications) to support mobile payments and the exchange of information with a tap of the smartphone. They also have a removable battery. A range of accessories for the new BlackBerry 10 smartphones, including the new BlackBerry® Mini Stereo Speaker as well as a variety of carrying and charging solutions including a unique charger that provides on-the-go charging, will be available from select carriers and retailers. In the U.S. market, we expect availability with most carriers for the BlackBerry Z10 to be in March. Today, U.S. carriers will start announcing pre-registration and price plans. We expect the first global carriers to launch the BlackBerry Q10 in April. We will announce new pricing and availability information as carriers roll-out around the world.